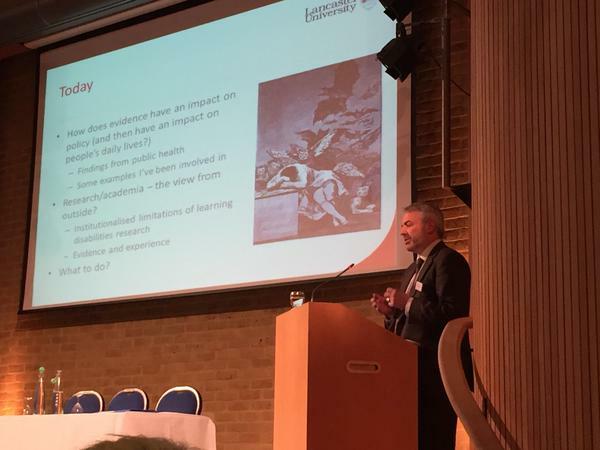 Day 12 of the #JusticeforLB Advent Calendar features Prof Chris Hatton‘s keynote lecture How does research have an impact on the daily lives of people with learning disabilities? to the Seattle Club Conference in Canterbury yesterday. 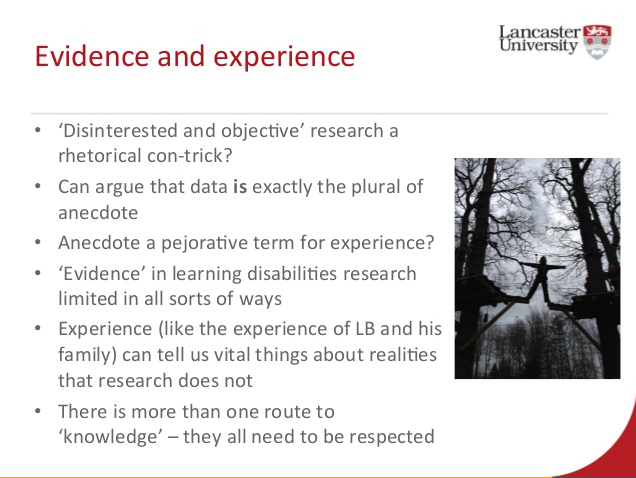 In his presentation Chris discussed how research can, or could, have an impact on policy and on the lives of people who are learning disabled. Not sure that we could ask for more than that! On which note, if you are reading this and agreeing or disagreeing with Chris, we’d love to hear from you, especially with regard to what the campaign has meant to you. Thank you. The Justice for LB campaign has reminded me how infrequently the voices of people with learning disabilities and their families are really heard ……..and the importance of experts by experience. The JusticeforLB campaign has profoundly affected how I feel about the world that I work in. I have spent many years working on and promoting the good stuff; self direction, people buying their own homes, choosing who they live with, getting jobs and getting good lives and working with the best organisations that help people achieve this. It is really easy to slip into a belief that everything is pretty good out there and all the ‘not so good’ (we never dare to just say crap/shite/appalling) organisations need is some guidance and examples of the good stuff for them to change- focusing on the positive will change things. I no longer believe this- not while there are the most vulnerable people in our society neglected, denied rights and dying. We need to challenge what is wrong, loudly and proudly. The LB campaign has enabled people who care to join together, share experiences and realise they are not lone voices. People who matter have been able to have their say. People who should be providing them with help have had to listen for perhaps the first time. The LB campaign has been powerful and will continue to be. The Justice for LB campaign is a stark reminder of why I do the work I do; that services for people with learning disabilities need to change and they need to change now. It’s a David and Goliath story. The giants are trying to squash us but they are not going to win. It’s a symbol of hope. There are enough of us now demanding enough is enough. It’s time people started listening to people and their families. Second best is no longer going to be tolerated. The LB community will not allow the status quo anymore. And it’s a reminder than Connor Sparrowhawk was one hell of a cool dude.